Mojito royale cocktails are a gorgeous apéritif with lime juice, raw sugar syrup, golden rum, fresh mint & cava. Perfect for summer cocktail parties! The sheer deliciousness of this cocktail made it very dangerous to test and photograph in the middle of the day and I singularly failed not to drink several of them along the way. At least it was my day off I guess ? Dark rum is a particularly good match for cava, so that is what I’m using to top up this cocktail. It’s also my favourite fizzy wine – always made using the traditional method of aging, no matter how cheap the bottle. Homemade raw sugar syrup is there to sweeten. Although I remain unconvinced that raw sugar is really any healthier than refined white sugar, I always try to go for the less processed option and like the lightly caramel sweetness of raw sugar better. Making your own sugar syrup is easy – it is generally just 50/50 (by weight) sugar and water, melted in a pan over the hob. I have included instructions in the recipe below. To help release the essential oils of the mint before adding them to the mix, lay the leaves on one hand and slap them hard with the other. Cook’s Illustrated tells me the same is true for basil leaves when making pesto. You should also keep the mixture moving until the shaker is very cold and frosted. Then, the drink will be perfectly chilled when you pour. A little top up of some lovely fizzy cava and you’ve got yourself a party! Fresh and cooling, zingy and minty, sweet and tart, boozy and lightly fizzy. That is what I am looking for in a cocktail, and this mojito royale fits the bill perfectly. Does that sound like your ideal cocktail or do you have different criteria in mind? I’d love to hear from you! 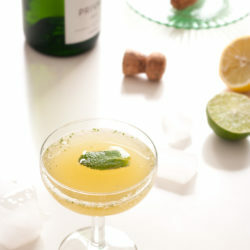 An elegant, fresh, boozy cocktail with dark rum, fresh lime juice, raw sugar, mint leaves and sparkling wine. 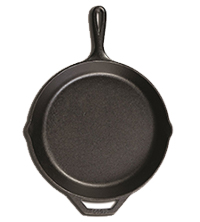 Add the sugar and water to a medium saucepan and heat over medium heat until the sugar dissolves. Continue to heat for 5-10 minutes, until the syrup thickens slightly. Turn off the heat and allow to cool. Transfer to a jar or bottle and store in the fridge. Chill the cocktail glasses by filling with ice while you make the cocktail. Squeeze the juice from the lime and add to your cocktail shaker - it doesn't matter if the juice and pulp make it into the mixture and the whole thing will be strained later. Measure in the rum and sugar syrup. Lay the mint leaves on one hand and slap them very hard with the other hand to release their essential oils. Add to the shaker. Thoroughly crush and combine the ingredients with a cocktail muddler, turning the shaker as you go to ensure the mixture is evenly muddled. If you don't have one, use some kind of similar implement and do your best! Fill the shaker three quarters full with ice. Put the lid on your shaker and shake hard back and forth, while moving it through the air in a clockwise/pentagonal shape so the liquid rotates as well as moving up and down. When the shaker is very cold and frosted it is ready. Tip the ice out of the glasses and divide the rum mixture between the glasses. Top up with the chilled cava. Pick a couple of the best looking mint leaves, lay flat on one of your palms and slap them hard with the other palm. Lay one leaf on the surface of each drink to garnish. This recipe makes more sugar syrup than you need, but it is very useful for drinks and desserts and will keep for a couple of weeks in the fridge. What a delicious looking recipe- I love the balance of flavors you have in it. Seems like a perfect starter! Sorry, Kelsey, I missed replyng to your comment somehow. Thank you! The drink was a lovely mix of sweet, sour, herbal, boozy loveliness! Thanks for the information, I’ll check it out.